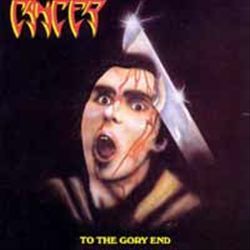 Telford´s finest CANCER formed in 1987, made their first demo in 1989, did a follow up in 1989 and was awarded a record contract. Happiness lasted until 1996, as they split up shortly after their fourth full length album “Black Faith”. The band returned briefly in 2003, released an EP, “Corporation$” and a full-length “Black Faith” before calling it a day once more in 2005 after “Spirit in Flames” was released. Many thought that was the end of the story. Since 2013 CANCER is back in business, re-releasing their three first albums via Cyclone Empire. Third time lucky? “To the Gory End” was released in 1990, somewhere around the days of Old School death metal and with an overall sound that tells its age. To their advantage there was not much of a black metal scene to pinch abominations from, instead there was thrash. Opener “Blood Bath” was blessed with a blistering riff and an opening growl, before a typically blurry riff commenced. The refrain has a hockey arena ring to it but is effective and almost a historic document. The band switched from thrash to classic death all the time, with “C.F.C.” being classic death. The refrain is yet another shout-along, and the riff is perfect. There wasn´t much grind in those days, but “Sentenced” is close. I personally prefer the likes of “Witch Hunt” where the drum pattern is fast, almost frantic, yet not subject to grinding. The big moments are “Into the Acid” and the blood curling “Imminent Catastrophy”. Or rather the perhaps biggest and the definitely not best sounding tracks are the bonuses. The leftover demos “Our Fate” and Revenged” have all the trademarks of classic Old School death metal. The thrash, the almost whispered vocals, everything an early death disciple could wish for. I strongly recommend this history lesson and display of how death metal should sound!